Early next year, Audi will begin the production of the A6 hybrid, its second hybrid model after the Q5 hybrid quattro. 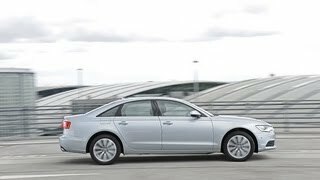 The Audi A6 hybrid 2012 employs an efficient parallel hybrid concept: Its combustion engine, a 155 kW (211 hp) 2.0 TFSI, works together with an electric motor that delivers 33 kW (45 hp) and 211 Nm (155.63 lb-ft) of torque. The electric motor sits directly behind the TFSI, occupying the space of the torque converter upstream of the modified 8-speed tiptronic. At a later point, Audi will begin series production of the A6 hybrid, its second hybrid model after the Q5 hybrid quattro. 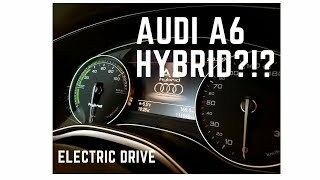 The A6 hybrid employs an efficient parallel hybrid concept: Its combustion engine, a 155 kW (211 hp) 2.0 TFSI, works together with an electric motor that delivers 33 kW (45 hp) and 211 Nm (155.63 lb-ft) of torque. The electric motor sits directly behind the TFSI, occupying the space of the torque converter upstream of the modified 8-speed tiptronic. The transmission sends torque to the front wheels. A crash-protected area of the luggage compartment houses a light, compact lithium-ion battery that provides 1.3 kWh of nominal power and generates 39 kW. Depending on requirements, it is air-cooled in two ways – by means of a blower from the interior or by means of an internal refrigerant circuit coupled to the automatic air conditioning system. This technology largely maintains the rechargeable battery within the appropriate temperature range, thereby ensuring that the vehicle operates on electric power a comparatively large percentage of the time. 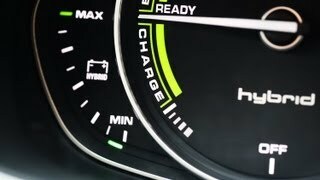 The Audi A6 hybrid can achieve speeds of up to 100 km/h (62.14 mph) purely on electricity; at a constant speed of 60 km/h (37.28 mph), it has a range of 3 km. It can also operate with the combustion engine only or in hybrid mode; in the deceleration phases, it recovers power and activates both the engine and the electric motor together when accelerating quickly. Special indicators on the instrument cluster and on the MMI monitor provide of detailed display of the different driving conditions. The Audi A6 hybrid provides the power of a V6, combined with the fuel efficiency of a four-cylinder engine. It accelerates in 7.3 seconds from zero to 100 km/h (62.14 mph), top speed is 238 km/h (147.89 mph) and the average fuel consumption is 6.2 liters per 100 km (37.94 US mpg), a CO2 emissions level of 142 grams per km (228.53 g/mile) (performance and fuel consumption figures are provisional).